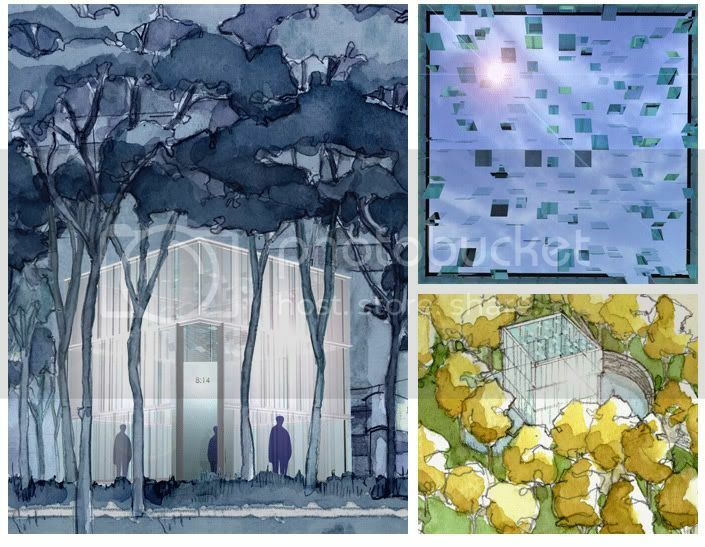 Boston-based Moskow Architects Inc. will design the pastoral setting that will honor the passengers and crew of American Flight 11 and United Flight 175, which crashed into the World Trade Center Towers Sept. 11, 2001. The flights departed from Boston's Logan International Airport and were headed to the West Coast. The memorial will allow for personal reflection and remembrance that acknowledges the profound impact of 9/11 on the Logan Airport community. 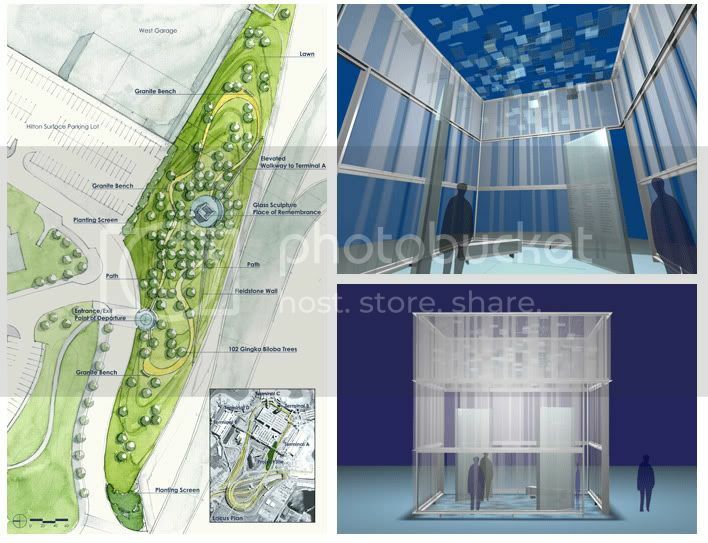 The memorial will include winding paths through a grove of Ginkgo trees; the paths will converge at a large glass sculpture -- the place of remembrance - that will contain two glass panels inscribed with the names of the passengers and crew of the two flights and their departure times from Logan Airport. When visitors gaze upward, the sky will appear fractured through a prism of reflective panels. At night, the sculpture will become an illuminated beacon. Visitors will exit the Memorial by returning to the point of origin, where the words "Remember this day" will be etched in granite paving. The two-acre Airport 9/11 Memorial site is close to the Logan Hilton Hotel -- the headquarters for Massport's family-assistance CARE Team in the aftermath of 9/11. The hotel donated a portion of the land to allow the memorial to be constructed on the selected site. Hilton also redesigned the hotel's building frontage to complement the memorial, scheduled to begin construction next summer and be complete by fall 2008. After the tragedy, airport employees wanted a way to honor those lost and decided a memorial would be most appropriate. The design selection process for the Memorial began in 2003. There's no real need for this, is there? I think there's definitely a need for a 9/11 memorial, especially in the city where the two most devastating flights originated. It's a shame about the location though, who's going to see it out there? I know I'm probably going to get bashed for this, but I would've wanted to see this (or something better) on the greenway. That's the one downside to this project. 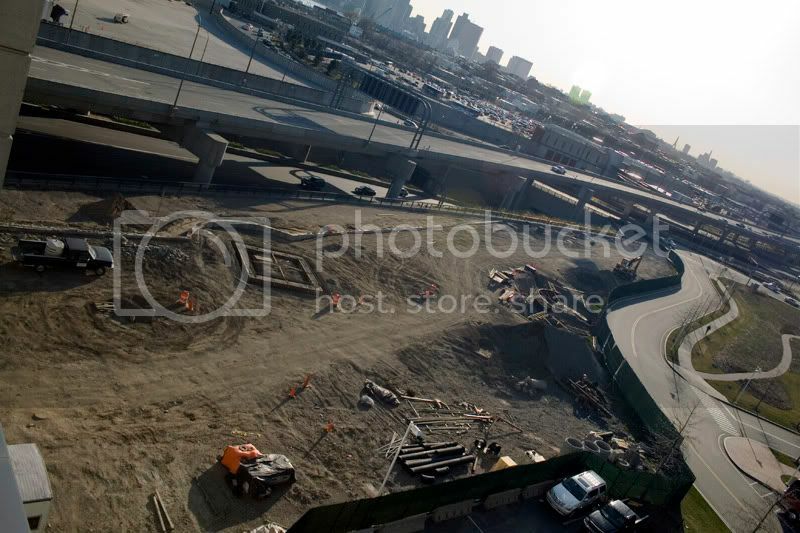 Not too many people venture out to that area of Boston, unless they intend to go to Logan (I think). However, I would not put this on the Greenway. I would put it somewhere where it is easily accessible and where people can see it easily. I think there's definitely a need for a 9/11 memorial, especially in the city where the two most devastating flights originated. I agree there was a need for this and it has been met. There is already a very tasteful memorial in the Public Garden. I think that is sufficient. If you read the article again, you'll see that this is intended primarily for airport employees. So it's entirely appropriate to put it at the airport. Wow, I never knew there was a memorial in the Public Garden. I need to go check it out. Where is it in the Public Garden? I agree with Beton Brut on the Common 9-11 memorial -- horribly bad execution. It's as if they were simply going through the motions. The Memorial itself is of pink granite, machine-engraved with a floral pattern. It brings to mind a sorta-but-not-really-expensive grave stone. Again, as Beton Brut says, it lacks any gravitas whatsoever. Maybe this is why vagrants find it so easy to snooze there without any apparent attacks of conscience. There is a 9/11 memorial at bc as well. I lost a relative on Flight 11, and I didn't even know about the Public Garden memorial. I think it's arguable whether or not there is a *need* for one, but as someone personally afflicted by this, I would like to visit the Public Garden memorial now that I know it's there. Does anyone know if there are any memorials here in Boston for Pearl Harbor? I'm nursing an interest in the use and placement of different types of memorials. American flags fly from the jetways at Logan where each flight departed. I like this memorial. It has the same quiet, contemplative modesty as the 3/11 memorial in Madrid. I went to the Public Garden memorial yesterday, and I would like to say -- It is a memorial for those who died during September 11 who were born/lived in Massachusetts. My relative was born in Rhode Island, was a resident of California, and was back in town visiting my family. Therefore, he did not make the "cut" of being on this memorial despite the fact that he has *strong* Massachusetts connections and was on American 11 from Logan. That is why I'm in favor of this memorial. I've had the opportunity to visit the memorial in Madrid with some friends of mine who live in the city and lost a relative in the Train Bombings there. If this is half as well done as the one in Madrid, then it will be a success.